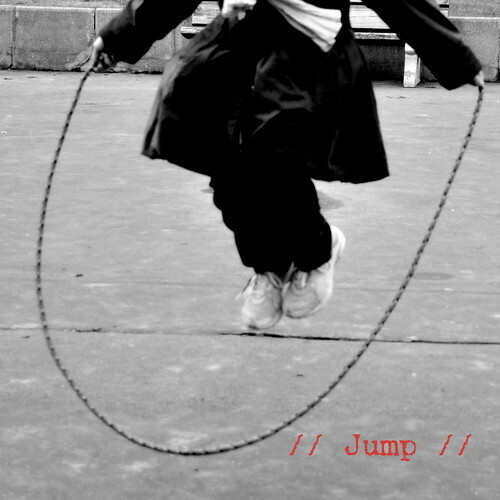 Little H. has discovered the fun of playing jump rope, recently. She needed to bring a jump rope to her gymnastics class and she's been hooked ever since. So far she used her sister's jump rope. We have more jump ropes at home but her sister's is simply the best. Basically, her sister's jump rope is nothing else but a rather thick climber's rope cut to length. We bought it that way a long time ago. It has a nice weight and doesn't curl or tangle like the regular plastic ones, and therefore the spinning of the rope is more regular which makes the jumping easier, especially for a beginner. Since I couldn't find any of these ropes around here, and I remember I found them a bit pricey at that time too, I decided to fix her a jump rope myself. 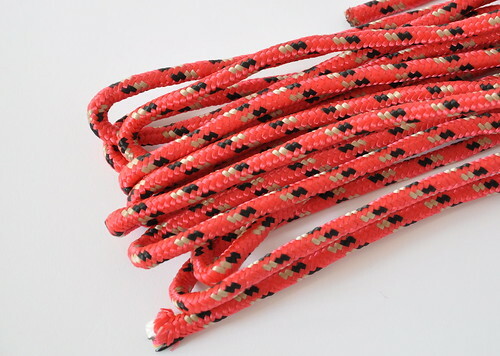 I simply bought a pack of thick colorful climber's rope at the hardware store, cut it to the right length, made a knot at both ends, burned the ends and all set. - don't take a rope which is too thin. You need a rope with a bit of "body" so it drapes nicely. This will guarantee smooth spinning and avoids the twisting and tangling typically for classic plastic jump ropes. Also, the thicker the rope the longer it will last. It outlives its plastic competitor, anyway, we found. - in order to get the right length, cut the rope such that when held in both hands and with both feet on top of the center of the rope, the rope ends come up to right under the armpits (make sure to add a bit of margin for knotting, so ideally you measure after having tied a knot at one end already) - if this isn't clear, check out this clip. - another advantage of this type of jump rope is that you can wash it when it gets really dirty. Wishing you some happy jumping and a happy Monday!